Boston, Massachusetts. 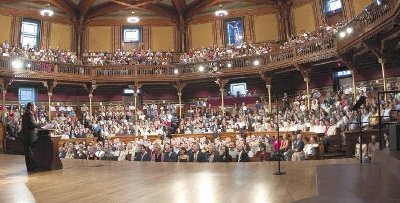 Prem Rawat, also known as Maharaji, addressed faculty, community leaders, guests, and students at Sanders Theatre, Harvard University. Many of the most venerable academic, political, and literary figures of the nineteenth and twentieth century, including Winston Churchill, Theodore Roosevelt, and Martin Luther King have taken the podium at Sanders Theatre. This event was followed by an event in Toronto. Maharaji was introduced by Richard Patten, a member of the Ontario Parliament. Patten credited Maharaji for bringing a remarkable message of hope. He noted that Maharaji speaks of a peace that is more than the absence of war, that institutions cannot bring, and that needs to be established by each individual. The event was broadcast via satellite to 106 locations in 28 countries.